The flames have hardly gone out in the Victorian bushfires, and a pattern is emerging, around claims that faulty electrical infrastructure is to blame. This is raising some serious questions about the conduct of the supply companies and the nature of the Victorian government subsidies to these companies. At Tathra, according to investigators with the Rural Fire Service, the fire was caused by faulty infrastructure in the electricity transmission network run by Essential Energy. The Electrical Trades Union (ETU) has blamed funding cuts, which have led to a reduction of maintenance. Assistant secretary Justin Page said the union had long been concerned about a backlog of maintenance to clear bush around electrical poles, and the union was not surprised at the cause, and that the State Government and national energy regulator needed to explain why they cut funding to the network. The investigators found that the problem on Reedy Swamp Road was the likely cause of the bushfire on Sunday, which wiped out 68 homes. Essential Energy has denied its responsibility in a carefully worded statement. “Preliminary internal enquiries indicate network protection equipment activated as it is designed,” it said. “An initial review also indicates that asset and vegetation inspections and maintenance in the vicinity of Reedy Swamp Road are up to date and in accordance with prescribed standards. 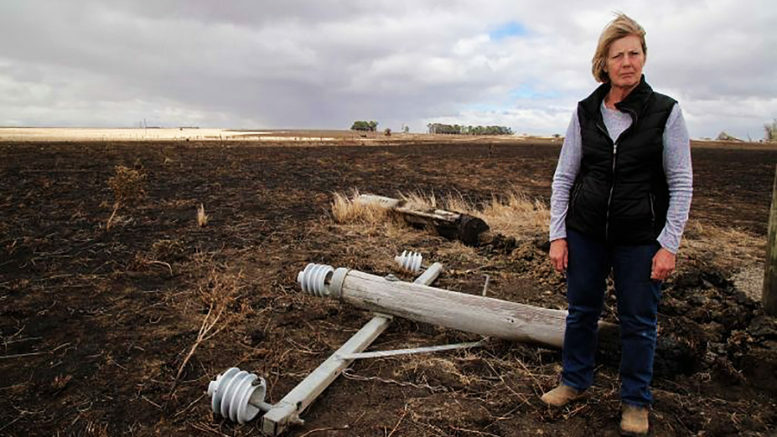 At the Garvoc fire, where 18 houses were destroyed along with 52 sheds, and at least 14,000 hectares of land was burnt, the cause was a faulty power pole that snapped during fierce winds. Brendan Pendergast from Maddens Lawyers in Warrnambool, who is representing a class action being made by residents against Powercor, told the ABC’s Statewide Drive, “This pole has obviously been identified as being structurally compromised. Jack Kenna, who lives at the Sisters near Terang, said the blaze started on his farm. At Gazette, a bluegum limb in a plantation fell onto powerlines. A similar thing happened at the Camperdown-Bullen fire, where power lines were brought to the ground. The Terang-Cobden fire was started by power lines clashing in the wind and causing electrical arcs that ignited the surrounding vegetation. All this points to s systemic failure, providing what appears to be clear cut evidence that the power companies are not spending enough to ensure that power is delivered through Victoria safely. There needs to be an investigation as to why this is the case, and this must lead to decisive action, which will ensure that the infrastructure is up to standard. Failure that leads to destructive fires is bad enough. But when this comes in tandem with government subsidies, it is even worse. A part of the problem may be the cutting of these subsidies. To many, there is something strange about funding the private sector, especially when power bills include an infrastructure fee. Taxpayers are handing over money twice. There is nothing wrong with cutting the dependence on taxpayer money. The problem is that if the subsidies are cut, this should happen together with measures that ensure the companies use their own money to do the job. The evidence suggests this has not happened, and the bottom line is that, if they cannot do it, they should not be running the system. It should return to public ownership. 1 Comment on "Victoria’s bushfires reveal a failure to maintain electricity delivery system"
Utilities such as gas,water,electricity and public transport should NEVER EVER be privatised.